This is a disposable products designed to clean the interior contact points of electronic devices that facilitate or produce data or information transactions. They remove dirt, dust, oils and other contaminants in a safe, efficient manner. Cleaning cards are used to ensure overall device efficiency and for preventing expensive maintenance and replacement costs by eliminating or minimizing failed transactions. Studies have proven that many devices aren't broken, they are just dirty. This product features patented Evanish solution that effectively breaks down dirt and debris in the card part and on thread head for effective cleaning; safe to use on electronic components. Dust, ink and debris can cloud the optical lens causing bad scans. This can make an automated system into a manual entry system increasing processing time. 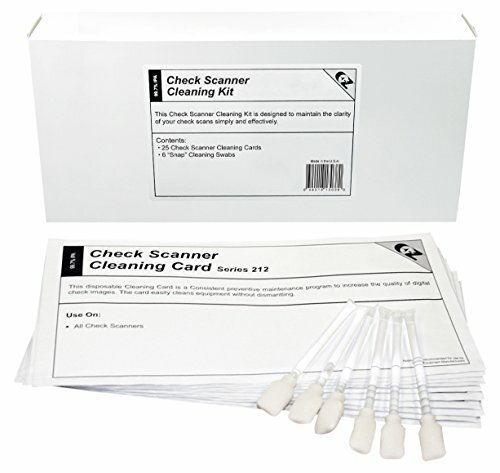 Clean your Check Scanner every 2000 scans or at least 3 to 4 times month. Dust, ink and debris can cloud the optical lens causing bad scans. Clean when experiencing poor print quality, illegible receipts, paper jams or print voids. Publisher: United Banking Supplies, Inc. Studio: United Banking Supplies, Inc. If you have any questions about this product by Waffletechnology, contact us by completing and submitting the form below. If you are looking for a specif part number, please include it with your message.